Do you hate the noise from the old style alarm clock? Scientific evidence, a gentle, gradual process of self-recovery is more conducive to people′s health. SveBake′s wake-up light can satisfy your need. 1. Only the brightness of the warm white light is adjustable, another color can't be adjusted. 2. Please pull out the battery insulating spacer at the first use. 3. The coin battery is only used for memory function. 4. Please don't press two or more buttons at the same time. 5. The battery is only used for setting backup. We'd suggest you use it with battery and power at the same time. * Press or touch any button except "SNOOZE" to stop the sound and light. * Press the "SNOOZE" button will stop the light and sound for 5 minutes. The sound will then start playing again and the light will come on and increase in intensity for 5 minutes. * Hold the button of the small sun sign for 3 sec to switch off the light. [PROGRESSIVE SUNRISE/SUNSET SIMULATION] - This progressive alarm clock comes with SUNRISE & SUNSET mode. In the sunrise mode, it will brighten gradually from 1% to 100% in 30 minutes before the alarm clock time, wakes you up gently from the deep sleep. In sunset mode, the light will be faded gradually as sunset, which helps you to fall asleep softly. 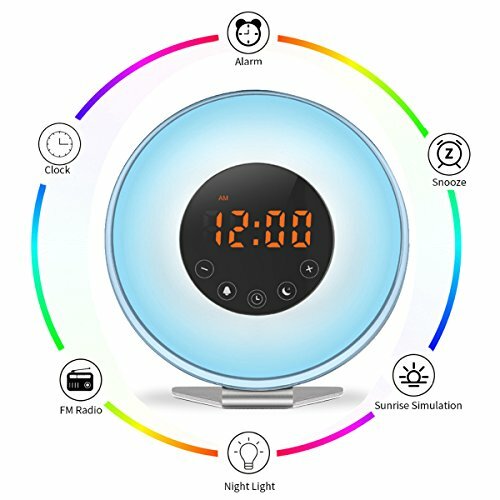 [7 LED COLORS & ADJUSTABLE BRIGHTNESS] - It supports 7 different colors of light(includes warm white, green, red, blue, yellow, purple, light blue). LED colored mood light creates a fascinating atmosphere, which can satisfy many people who meet different needs. Besides, the warm white LED can be used as a bedside lamp with 10 brightness settings(other 6 colors are not adjustable). [UNIQUE DESIGN & USER-FRIENDLY] - The stylish and multi-functional design with the easiest setup guide. Built-in 15 warm white LED and 15 RGB LED. Powered by 1*CR2032 (included) or Mirco USB cable (included) or adaptor (included). You can take it everywhere you want to go. [AN IDEAL GIFT] - SveBake wake-up light comes with alarm clock, besides lamp, night light, atmosphere light and FM radio. It is the good choice as a gift to your lover, family or friends for Easter, Birthday, Christmas, or holiday, and more.